Elegant Loft by " villalesirene.com "
Casa Vacanze Villa Le Sirene is a XVII century palace recentely restored in the heart of Positano, with a view of the famous Spiaggia Grande . The villa is located in a magnificent and very central location. there are 67 steps from main road Viale Pasitea. It has a large living area furnished with 2 sofas in a TV area, and a dining. The room is double-volume, very high with traditional cupola-ceilings. Double-doors open to a veranda which overlooks the main church of Positano, Santa Maria Assunta, and the main beach, Spiaggia Grande. The bedroom is on the loft and there is a double bed as well as an additional single bed. On this same level is a bathroom with a shower. Supermarkets which offer home delivery, post office, shops, pharmacy and restaurants are at walking distance. Bus connections with , Amalfi, Ravello, Sorrento, Maiori and Salerno are far s 450 mt from the Villa . Ferry connections to Capri Island are available from Positano, Amalfi, Praiano and Naples. This is a spectacular apartment in Positano and we had a wonderful week staying here! The views are amazing and the overall service and experience from the moment we reserved to the day we left was perfect. We especially enjoyed the open loft style bedroom and the living room French doors which we kept open every night to enjoy the cool breezes and air. The location is perfect - you can take a flight of stairs directly to the upper road where there is a small grocery store and several nice restaurants or you can take a picturesque stairway directly to the town close to the beach. Although there are a lot of stairs, the views are amazing and we took our time walking up and down to enjoy these views. We've stayed at other apartments in Positano and other places in Europe and quite simply, this was the best! We'll definitely be back soon! we are so glad for this. Chiara & Giuseppe were OUTSTANDING hosts. Upon arrival, we were greeted by them both and given a tour of their beautiful property. They were so generous offering us a bottle of wine and fresh pastries and fruit, they really made us feel as if we were at home. The kitchen was well stocked and the washer and dryer was a plus!! Overall, what an incredible property and authentic Italian hospitality. Our friends were staying at a hotel up the road where they paid upwards of $500 a night and their place did not compare to size, view, and home comfort of this location. Chiara even offered me sauce tips as I was cooking one evening and Giuseppe allowed me to tour the garden on the property and use some of his ripe tomatoes. If you want an authentic Italian experience with wonderful hospitality, views, and property -- Look no further. I will be sending my parents here and I can't wait for them to experience this. Bravo Chiara & Giuseppe. Gaby and I consider you family and we can't wait to be back! Fantastic property, and best views in Positano! This wasn't our first time staying at Villa Le Sirene. We've been here twice before and had a great experience each time! The owners Chiara and Giuseppe go out of their way to make your stay special and memorable. 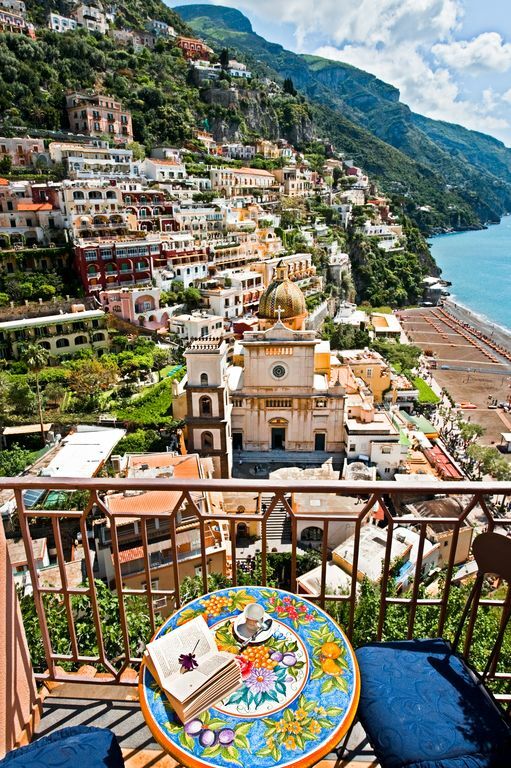 The views out of these apartments are the best in Positano! Don't hesitate to book, you'll be glad you did, especially when you enjoy your breakfast on the balcony each morning. :) The villa is just a short stroll from the center, and there is a grocery store just a few steps from it. Highly recommend this property. we are always glad to host you belong our villa..........it is your second home , can't wait for your come back. I had wanted to go to Positano since the 1980's. I had once heard it was like "Heaven on earth" and it is. I am not a night owl, but many nights would sit on the balcony listening to the City and taking in all of the lights. Chiara and Giuseppe are so kind and very helpful. I cannot voice enough about the amazing view from our villa. The villa was great...very spacious. We cannot wait to visit again! Thank you Chiara and Giuseppe for sharing your home with us. Thank you so much for your kindness & to choosed our Villa for your stay ! My husband and I greatly enjoyed our stay in this fantastic loft apartment in September. The location is perfectly situated to the beach, restaurants, grocery and city center. Our hosts provided us with very good recommendations and a cell phone which was most useful when making dinner reservations. It was unexpected and very special that they had fresh fruit, wine and limoncello for us upon our arrival! The apartment is well appointed providing everything you will need for a wonderful holiday! All you need is to bring yourselves and enjoy Positano! Do take advantage of the limo service that they recommend for transport to and from the airport and for a day trip to enjoy the surrounding area. There is a small charge for electrical usage payable at the end of your stay which is very reasonable and understandable. We plan to return again next summer with our family and would not consider staying anywhere else! Thank you Chiara and Giuseppe!